Stone From 770 at Groundbreaking Frigid outside temperatures didn’t deter more than 50 people from celebrating with Chabad Lubavitch of Boulder as they broke ground on their new Jewish Learning Center this afternoon. 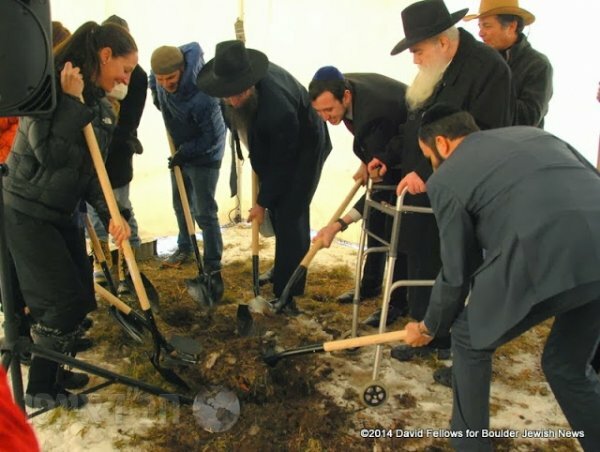 A heated tent, hot food and drink and the warmth of community sustained the crowd as several speakers invoked memories of the Great Boulder Flood of 2013 as the flashpoint for making the long-time dream of a new Learning Center at 2810 Jay Road a reality for Chabad of Boulder. Rabbi Pesach Scheiner welcomed everyone and introduced the series of speakers that extolled the Scheiners and the Boulder Jewish community for making this project finally happen. Stuart Feinhor, representing Congressman Jared Polis, congratulated the community on this milestone; Mendy Scheiner, Development Director and Flood Relief Coordinator of Chabad of Boulder County; Rabbi Tzvi Steinberg of Congregation Zera Avraham in Denver; and Rabbi Moshe Scheiner of the Palm Beach Synagogue, Rabbi Pesach’s younger brother and a key supporter of Boulder Chabad’s building project. The new Jewish Learning Center is expected to open on September 11, 2014, the one-year anniversary of the Great Boulder Flood as proof that from disaster, a strong community can rise again. After the speeches, the groundbreaking commenced, as Rabbi Pesach Scheiner led a group of supporters and guests in attacking a small area of thawed ground with shovels. Rabbi Yisroel Popack was given the honor of placing a brick from the legendary “770″ building, the world headquarters of the Chabad Lubavitch movement at 770 East Parkway, Crown Heights, into the hole dug by the shovelers.